SALT LAKE CITY - Feb. 23, 2017 - PRLog -- Veteran adventure travel company, Holiday River Expeditions (http://www.bikeraft.com/), embraces the International Dark Sky movement that helps preserve unadulterated night skies at designated sites around the world. Last year they launched a series of trips dedicated to viewing the night sky with an expert from Salt Lake City's Clark Planetarium. Trips were a sell-out. "With the success of our first year's trip series we have expanded our offerings from four to six departures with a trip leaving every month from May to Oct," explains John Wood, Co-Owner and President of Holiday River Expeditions. According to Wood, Utah's parks, monuments and public lands and Idaho's vast River of No Return wilderness, where Holiday operates, are among the few remaining places in the contiguous United States where one can still marvel at the brilliance of the unmasked Milky Way with the naked eye. After active days of biking, hiking and river rafting Holiday River Expeditions (http://www.bikeraft.com/)' guests will enjoy curated stargazing long into the night. Young and old will learn from a dedicated astro wiz on loan from Clark Planetarium while wrapped in a dark canopy free of light pollution. Tom Beckett of Clark Planetarium (board chair of Clark Planetarium and part-time guide for Holiday River Expeditions) will accompany all the trips. The world's leading expert on light pollution will also join an Aug. 17-20 trip through Lodore Canyon as part of the expanded Dark Sky Stargazing Trip Series (http://www.bikeraft.com/dark-sky-stargazing-trip-series/). Dr. Fabio Falchi is the world's leading scientist on light pollution and the disappearing dark sky and author of "The World Atlas of Light Pollution." He is on the faculty of the Department of Astronomy, University of Padua, Italy. This trip immediately precedes the August 21, 2017 solar eclipse, which will be a focus of discussion. The series kicks off and wraps-up with the White Rim Trail Stargazing Trip that features world-class mountain biking through a fantasyland of red rock wonders May 7-9 and Oct. 1-4. The setting is Canyonlands National Park, recently designated a Dark Sky Park. The per person rate is $770. See http://www.bikeraft.com/specialty-trips/white-rim-trail-stargazing-trip/. Desolation Canyon Stargazing Trip June 19-23 introduces families with kids as young as five to the thrills of river rafting on the Green River. The per person rate is $1,125; 18 and under $925. See http://www.bikeraft.com/specialty-trips/desolation-canyon-stargazing-trip/. Cataract Canyon Stargazing Trip is July 17-21 on the Colorado River as it cuts through the heart of Canyonlands National Park. Guests raft and hike through this natural playground. The per person rate is $1125. See: http://www.bikeraft.com/specialty-trips/cataract-canyon-stargazing-trip/. 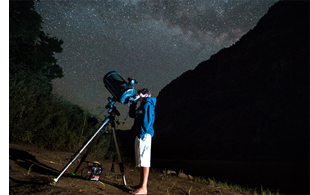 Lodore Canyon Stargazing Trip Aug. 17-20 focuses on river rafting on the Green River in Dinosaur National Monument, designated by the National Park Service as a Sanctuary of Natural Darkness. The per person rate is $995. Dr. Fabio Falchi, the world's leading scientist on light pollution and the disappearing dark sky, will be along. See: http://www.bikeraft.com/specialty-trips/lodore-canyon-stargazing-trip/. Per Beckett, "All of Holiday River Expeditions' trips out on August 21st will experience 86+ percent of the eclipse. The Main Salmon Trip will experience a 97 percent eclipse." All of these trips will have solar glasses available to guests for safe viewing. A few stargazing highlights for this summer: In May and June, Jupiter and its moons will be high in the night sky. In July and August, Saturn and its rings will be high in the night sky. Moreover, this summer Saturn's rings will be tilted toward the earth at a greater angle (and thus more visible) than they have been in 14 years. Saturn's rings will not be as visible as they will be this summer until 2031. About Clark Planetarium, Salt Lake City: Clark Planetarium is one of the world's leading centers for space and science education. Clark Planetarium's mission is to create and present stimulating educational programs that effectively share astronomy and space exploration information with Salt Lake County residents, Utah students, educators and families, and visitors from around the country and the world. For more information visit www.clarkplanetarium.org. Holiday River Expeditions (http://www.bikeraft.com/) began in 1966, when Dee Holladay and his wife Sue took the plunge to become river outfitters. Due to its respect for the lands, rivers, guests and employees, the family-owned-and-operated company has grown exponentially. Each of its guides is professionally trained in first aid and river safety, and with 50 years of experience, the company provides guests the opportunity to explore the nation's wild lands safely and securely. Holiday River Expeditions has a commitment to protect the environment through education and conservation, and as such, uses oar-powered and paddle rafts exclusively. For more information, availability, reservations or a copy of the 2017 catalog please call 800-624-6323, Email: Holiday@BikeRaft.com or log onto: http://www.bikeraft.com/.